I have been tackling the more unpleasant baby item research topics lately: carseat, stroller, and a baby book for dads. I say unpleasant because the first two tend to be needlessly overcomplicated, questionably expensive, and involve the guilt trip of safety features and safety ratings, and the last one involves a jungle full of baby books that either talk down to dads in a cold, sterile manner while not giving very much useful information, or they take a “hur-hur-hur” buddy-buddy approach while also talking down to dads and not giving very much useful information. I did get to sort through most of those things over the last couple of days, but finally I swept it aside and revisited my fleeting little question about cosleepers. I looked into real cosleepers first. They look like cribs, but the bottom is higher off the ground, and the sides tend to be mesh fabric around a frame creating three very short walls. 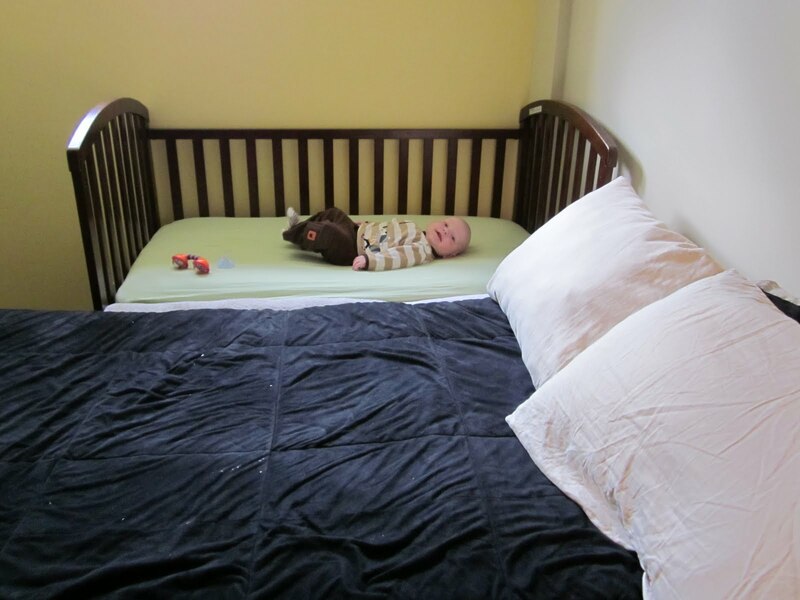 The problem with normal cosleepers is that they can only be used until the baby is 5 months old or until he can push/pull himself upright, whichever comes first, because then the short walls of the cosleeper are quite easily breached. That’s not a very long time to use something which has a price tag that starts around $140, especially when after that short period of time, you have to purchase an equally-pricey crib to replace it. I don’t want to simply dismiss the benefits of cosleeping and, heaving a heavy sigh, have to stagger out to the living room or other ridiculous location (namely the kitchen), lean over and heave Guppy over 24 inches or so of crib railing every single time he makes a peep. It is hard enough for me to fall asleep (and it has been for my whole life) without being thoroughly awakened whenever I do manage to fall asleep. Even if cosleeping had none of the benefits that Dr. Sears so passionately promotes (yes, those are two different links), I would still give it a go because, well, I like sleep and even under normal circumstances it is difficult to achieve, which is why I have such a hard time getting up in the morning. This dual cosleeper/crib arrangement was bothering me. SO. I casually wondered if there was any way to build our own cosleeper. I have these crazy notions from time to time that basic wooden shapes like cribs and cosleepers ought to be cheaply and easily made with lumber from a home improvement store, some metal reinforcements, and a lot of power drill use. Well, I googled “diy cosleeper” and found some nifty but ultimately vague results, such as this blog entry written by a couple who designed their own cosleeper based on one which isn’t sold in the US. However, it still has the problem of being small with short walls, which means the baby will quickly grow out of it and we’d still need to buy a crib. So then I thought, well, how is a crib constructed? Would it retain its structural integrity if we simply left off one of the sides and secured it to the bedframe so it would stay snug and close? 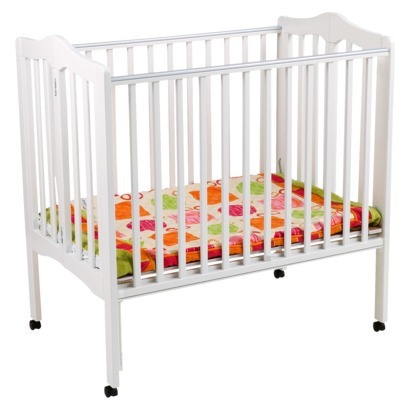 I searched the Target website (useful for entry-level research) for a basic, cheap crib and found the Delta portable crib. Then… I found the terminology that would make my search so much easier when I stumbled upon this blog post titled “How We Sidecarred Our Crib”. My reflexive twinge at creating verbs out of nouns notwithstanding, it was exactly the solution for which I was looking. 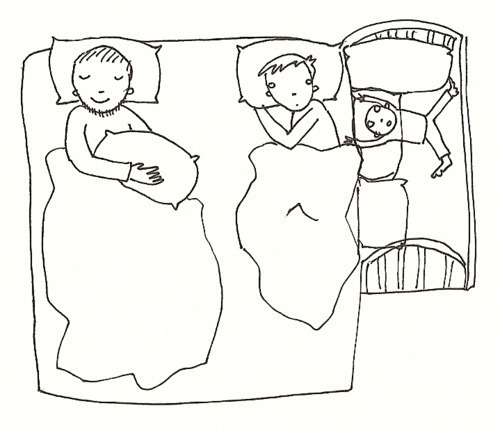 The best part is that even if cosleeping does not work out for us at all – in case the baby develops the ability to wriggle his way onto my face and smother me at night, or something – we still have a crib, and have not spent money on something we aren’t going to use. This isn't the same one as the one in the post, but it is an excellent photo of a sidecar crib. Finally, I knew exactly what to search for, so I looked up a video about how to modify a crib into a sidecar crib, and lo and behold… the folks in the video used the same crib I was thinking of using! I am very excited about this prospect, now that I know it is doable, that people do it, and that they even do it with the inexpensive, simple materials I want to use. This entry was posted on Sunday, March 4th, 2012 at 8:46 pm	and posted in Uncategorized. You can follow any responses to this entry through the RSS 2.0 feed.